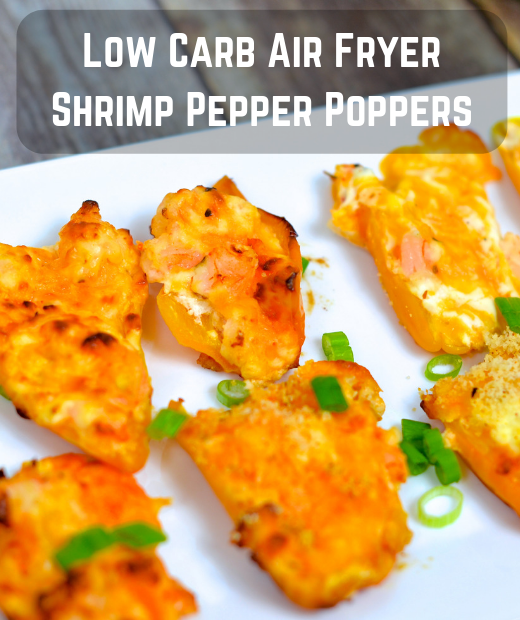 This step by step recipe for preparing low carb air fryer shrimp pepper poppers is super easy and yummy. 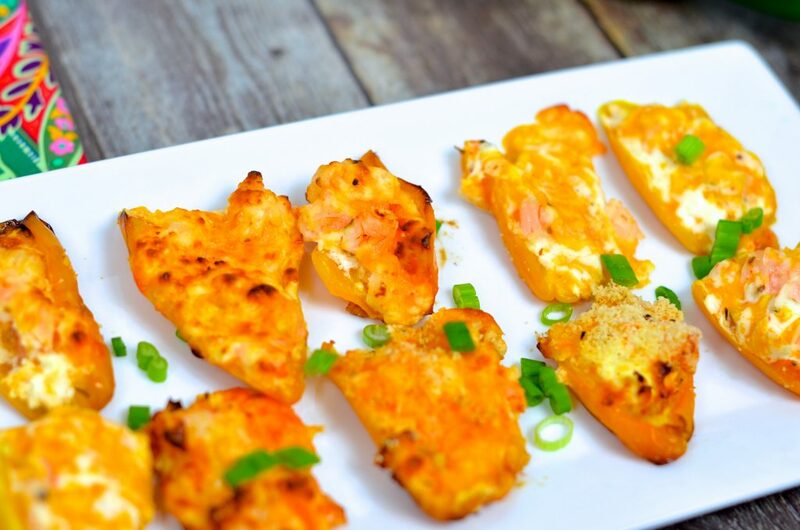 I promise you won’t miss the ‘breading’ found in many of our pepper popper recipes! No Air Fryer? No worries! We discuss how to prepare in the oven! Question Time: Who loves a pepper popper? Crunch. Spice. 2 words that make my heart (and stomach) sing. The ever-popular pepper poppers are delicious and pretty much on every appetizer menu. From bacon wrapped, to deep-fried, the pepper popper was everything I loved (by now you all know I don’t love green shakes), but the carbs made me run away! My family is ‘ok’ with pepper poppers, but didn’t share the love eyes I have when I view the words ‘pepper poppers’ on an appetizer menu. This popular appetizer dish threw me a bit of a curve ball – most poppers are either fried or topped with some type of breadcrumb combined with my family thoughts of this dish being ‘ho-hum.’ Truthfully, my kids do not care for the heat of the jalapeno, and of course, no frying or use bread crumbs in the Skinny Louisiana house. For the final touch, I had to add a Louisiana twist to the pepper popper. It was time take the popular poppers (say that 3 times fast) recipe to the Skinny Louisiana drawing board. 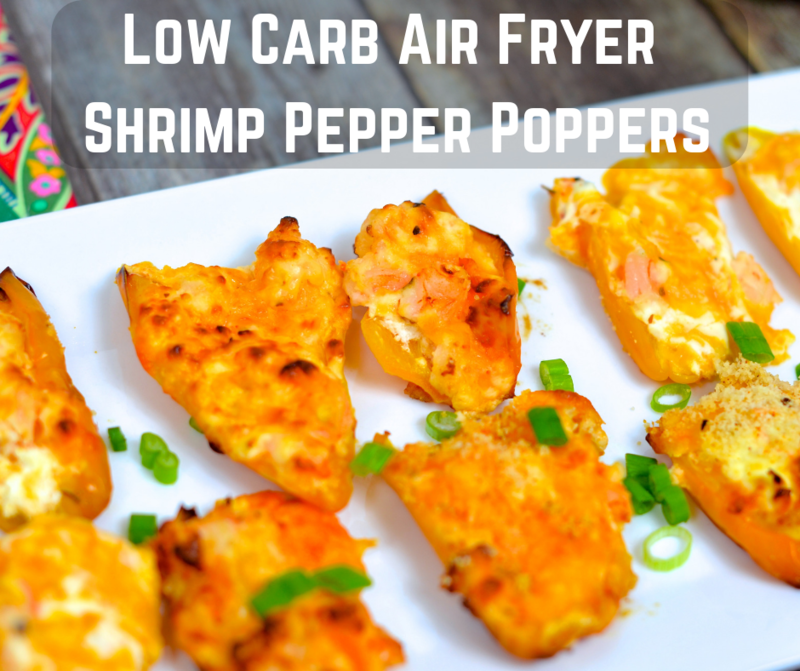 Using the Air Fryer, a few simple ingredients, and a Louisiana super food we have an amazing Low Carb Shrimp Pepper Popper the entire family will love. Before I go over ingredients, know the items used in this recipe can be found at many of your local supermarkets and Drug Emporium. Many of you know my love of Drug Emporium stores. Not only does Drug Emporium have amazing prices (often the cheapest in town), I work with this amazing company in putting on Low Carb Food Demonstrations and product selection for shelves. Many of my items (with the exception of the shrimp and mini peppers) in this recipe are from Drug Emporium. For a full list of Drug Emporium store locations, click here. No Drug Emporium in your town? No worries, you will be able to find these ingredients at your local supermarket. What Air Fryer Do I Use? I love my Air Fryer! Many of you have posed the questions, ‘What Air Fryer do you have?’ ‘What is your favorite brand of Air Fryer?’ I have a basic Phillips Air Fryer and love it. I encourage folks to shop around and see what Air Fryer fits their needs. For more Air Fryer recipes, check out my Air Fryer Dill Pickle recipe. Peppers (mainly jalapeno) are the basis of any pepper popper recipe. We used our mini peppers in this recipe with a serving (6 halves) yielding approximately 5 grams of carbs and 2 grams of fiber (depending on size). Since this recipe contains shrimp, be very careful reheating. Overcooked shrimp can become very rubbery. I would heat for a very short period of time. PREP your shrimp and peppers. Make sure shrimp is peeled and deveined. Chop shrimp using a sharp knife and place aside. Using a NEW cutting board, cut peppers longwise. Clean out all seeds. Place aside. 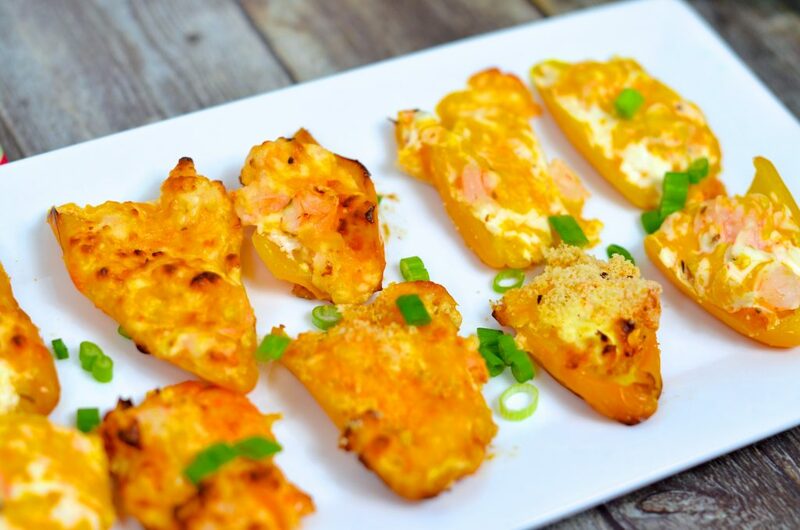 In a small bowl, combine cream cheese, Greek yogurt, shredded cheddar cheese, and seasoning. Using a rubber spatula, combine all ingredients. Using a tablespoon, scoop cheese mixture and ‘stuff’ pepper half. When all peppers are stuffed, line in Air Fryer. Cook at 360 degrees for 8-10 minutes. How to Make Low Carb Shrimp Peppers in the Oven. Make sure shrimp is peeled and deveined. Chop using a sharp knife and place aside. Preheat oven to 350 degrees. Line a baking sheet with non-stick aluminum foil. Using a NEW cutting board, cut peppers longwise. Clean out all seeds. Place peppers on baking sheet. Spray peppers with non-stick cooking spray. Roast in oven for 15 minutes. Remove from oven and let cool. Using a tablespoon, scoop cheese mixture and ‘stuff’ pepper half. When all peppers are stuffed, line on baking sheet. In a small bowl, combine shrimp, light cream cheese, Greek yogurt and Tony’s lite Cajun Seasoning. Scoop mixture by tablespoon full into pepper half. Spray Air Fryer basket with non stick cooking spray. Line peppers in Air Fryer. Air Fry at 360 degrees for 8-10 minutes. Preheat oven to 350. Line a baking sheet with non-stick aluminum foil. Place halved peppers on baking sheet. Spray TOP with non-stick cooking spray. In a small bowl, combine shrimp, light cream cheese, Greek yogurt and Tony’s Bold Cajun Seasoning*. Place aside. Scoop mixture by tablespoon fulls into pepper half. Bake in oven for 15-20 minutes. *Note we did sprinkle our peppers in the oven with a 1/2 tsp of almond flour. Yield: 18 poppers, 3 per serving. Nutrition Facts per Serving: Calories: 180, Total fat: 8g, Saturated fat: 5g, Cholesterol: 105 mg, Sodium: 520 mg, Total carbs: 6g, Fiber: <1g, Sugar: 3g, Protein: 20g. 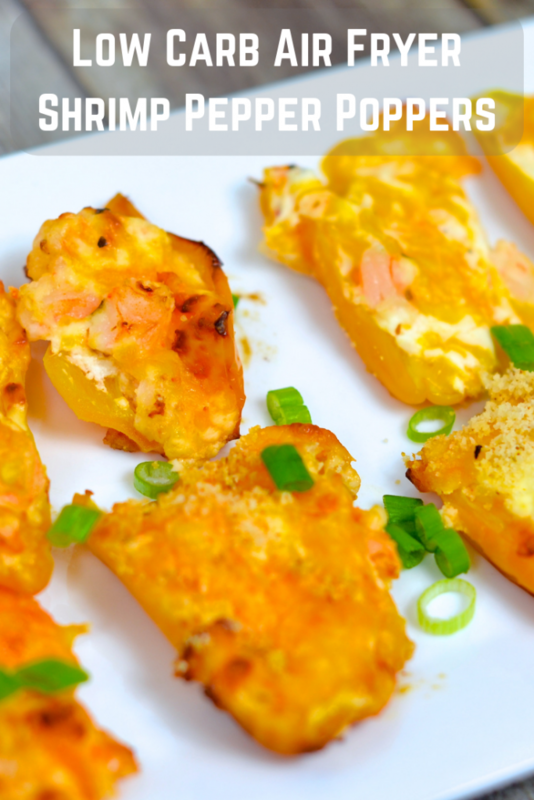 This recipe was developed and copyright by culinary dietitian Shelly Marie Redmond. She is the author of Skinny Louisiana…in the Kitchen and upcoming Skinny Louisiana…in the Slow Cooker. She practices out of Eberhardt Physical Therapy which she co-owns with her husband Greg.